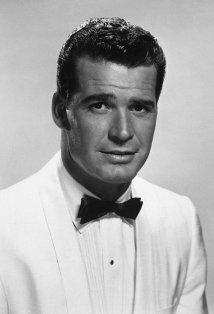 Wiki Biography: The son of an Oklahoma carpet layer, James Garner (born James Bumgarner) dropped out of high school at 16 to join the Merchant Marine. He worked in a variety of jobs and received the Purple Heart when he was wounded during the Korean War. He had his first chance to act when a friend got him a non-speaking role in the Broadway stage play "The Caine Mutiny Court Martial (1954)". Part of his work was to read lines to the lead actors and he began to learn the craft of acting. This play led to small television roles, television commercials and eventually a contract with Warner Brothers. Director David Butler saw something in Garner and gave him all the attention he needed when he appeared in The Girl He Left Behind (1956). After co-starring in a handful of films during 1956-57, Warner Brothers gave Garner a co-starring role in the the western series "Maverick" (1957). Originally planned to alternate between Bart Maverick (Jack Kelly) and Brett Maverick (Garner), the show quickly turned into the Brett Maverick Show. As Maverick, Garner was cool, good-natured, likable and always ready to use his wits to get him in or out of trouble. The series was highly successful, and Garner continued in it into 1960 when he left the series in a dispute over money. In the early 1960s Garner returned to films, often playing the same type of character he had played on "Maverick". His successful films included The Thrill of It All (1963), Move Over, Darling (1963), The Great Escape (1963) and The Americanization of Emily (1964). After that, his career wandered and when he appeared in the automobile racing movie Grand Prix (1966), he got the bug to race professionally. Soon, this ambition turned to supporting a racing team, not unlike what Paul Newman would do in later years. Garner found great success in the western comedy Support Your Local Sheriff! (1969). He tried to repeat his success with a sequel, Support Your Local Gunfighter (1971), but it wasn't up to the standards of the first one. After 11 years off the small screen, Garner returned to television in a role not unlike that in Support Your Local Sheriff! (1969). The show was "Nichols" (1971) and he played the sheriff who would try to solve all problems with his wits and without gun play. When the show was canceled, Garner took the news by having Nichols shot dead, never to return in a sequel. In 1974 he got the role for which he will probably be best remembered, as wry private eye Jim Rockford in the classic "The Rockford Files" (1974). This became his second major television hit, with Noah Beery Jr. and Stuart Margolin, and in 1977 he won an Emmmy for his portrayal. However, a combination of injuries and the discovery that Universal Pictures' "creative bookkeeping" would not give him any of the huge profits the show generated soon soured him and the show ended in 1980. In the 1980s Garner appeared in few movies, but the ones he did make were darker than the likable Garner of old. These included Tank (1984) and Murphy's Romance (1985). For the latter, he was nominated for both the Academy Award and a Golden Globe. Returning to the western mode, he co-starred with the young Bruce Willis in Sunset (1988), a mythical story of Wyatt Earp, Tom Mix and 1920s Hollywood. In the 1990s Garner received rave reviews for his role in the acclaimed television movie about corporate greed, Barbarians at the Gate (1993) (TV). After that he appeared in the theatrical remake of his old television series, Maverick (1994), opposite Mel Gibson. Most of his appearances after that were in numerous TV movies based upon "The Rockford Files" (1974).